So You’re Thinking of a Standing Desk? Learn From Us. A few AICR staff enjoying standing while working! There’s been a buzz around the AICR office lately. 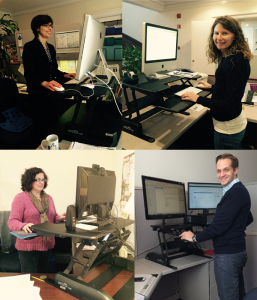 Not only because we kicked off our CanPrevent campaign, but a new wave of staff has opted to install standing desks! It’s wonderful to walk past offices and see some of my colleagues standing tall and typing away or reading. Our organization offered them to us because studies have suggested that sitting or lying down for long periods of time may play a role in increased cancer risk. Standing doesn’t replace being active, but it is one way to put AICR Recommendations into action. Standing desks were new to everyone here, so I went around asking my coworkers about their experiences and challenges. Here’s the overview. Two challenges people faced were getting sore feet and going back and forth between documents on their desk and computer when they were standing. Comfy shoes and adapting your desk space could help – see tips below. No one reported difficulties focusing; on the contrary, quite a few people said that standing improved their focus. One person said that standing with his computer removed him from distractions on his desk, bringing him and his work to a separate level. While many colleagues downloaded a computer application to remind them when to stand, most people ended up simply listening to their bodies. One person reported that he comes in each day, spends the first 45 minutes sitting and planning his day, and then when he stands, his mind snaps into focus and he’s all business and productivity. He alternates sitting and standing 45 minutes at a time. Another co-worker, on the other hand, starts her day off standing and listens to her body to let her know when it is time to sit. It’s true, I almost always see her standing when I walk by her office. Everyone I spoke with was very happy with his or her choice. And everyone said they were surprised at how long they can stand and how quickly time passes while standing. More energy, less pain, and improving mood were just a few of the reasons people gave. 1. Do your research to find the right standing desk for you. There’s a large variety of shapes and sizes. Some may work better with desktops or laptops. Also think about what you need around your computer when working. 3. Have comfortable shoes – you can keep an extra pair by your desk. And as a bonus, you will no longer have an excuse to not take a walking break during the day. 4. Use a computer or cell phone app to remind you to stand. 5. Make the commitment – this is not just a fad, but a whole new work style that is critical for your long-term health. I myself have not elected to go for the standing desk. I wasn’t thoroughly convinced when our director of HR (and lead of AICR’s Health@Work campaign) sent out an e-mail asking who wanted one. I like the way my desk is set up right now and something would have to change. But I find myself secretly jealous of those who get to stand regularly while they scroll away. I’ve installed the Varidesk desktop app which pops up on my screen every 20 minutes and reminds me to stand for 5 minutes. I get up and refill my water bottle, check the printer or my mailbox, or just go up and down the stairs. But none of those activities take the full 5 minutes and I end up back at my desk shortly, standing in a slouched position so I can type as I angle my head to see my screen. This is my short-term solution. I think I might have to take the plunge the next time the offer comes along to get a standing desk. You can read more about the research on inactivity and cancer risk in CRU. Like Whitney, I decided to try out a standing desk without a financial commitment by using something I already had on hand: an ironing board. (I work almost exclusively from my home office.) I’m tall, so I had to stack some books to raise my laptop to a workable height. But work it does! At some point I may invest in a “real” standing or treadmill desk, but for now, this works! There’s room for extra materials on each side of my laptop. Right now, I’m the only one at work w/ a standing desk. I made it myself out of two plastic crates that I found in a storage room. I’ve had it for about 3 weeks now. I’m the hired nutrition educator for schools/community in our area, so I always want to try and practice what I preach. I am more focused/can engage in work more easily. Comfortable/cushioned shoes are a must. I estimate that I sit a total of 20-40 minutes during an 8-hr work day. I’m motivated to continue this to see if I can see/feel long-term improvement.